When I was a kid, my mother would often make us the special treat of peanut butter sandwiches on white hamburger buns. Oh mama, I can still remember the sticky sweet taste and, of course, washing it down with a large glass of ice cold milk. Now, it makes sense my mother would turn us loose in the backyard for hours after feeding us the equivalent of sugar in a straw. Anyhow, we know the best part of any burger is the bun. This bun recipe is the perfect texture and taste. It’s not sweet but I guess you could add a little honey if you’re so inclined. My son snatched one from the counter and happily chanted “bread, Little eat bread” before it quickly disappeared. Update: A little shameless share. 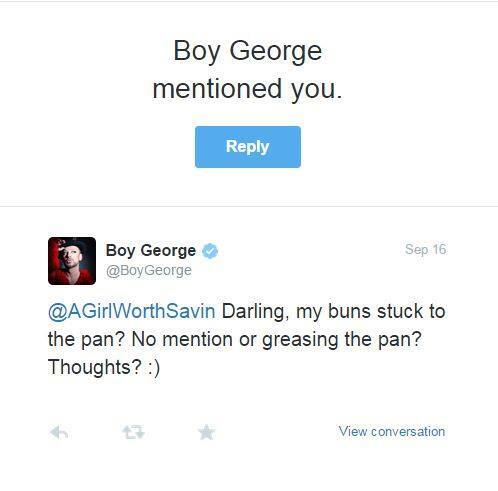 I was so excited (and tickled pink) when the amazing Boy George made this recipe! Set out your nonstick hamburger pan. If your nonstick has ever been washed in a dishwasher it has lost it's ability to stick properly so grease the pan with coconut oil, lard or sustainably raised palm shortening. Place your cashews in your blender or food processor and grind into a flour. Then add in the rest of the ingredients. Blend completely until you have a batter. Pour the batter into your nonstick hamburger bun pan and bake at 350 degrees for 25 - 30 minutes. You can slice the buns in half if you would like. Interesting. I’ve never attempted gluten free bread, but these sure do make the burger look cute. We have a severe cashew allergy in the house. Can you recommend a good substitute? These look great, would really like to try them! Rebecca, you can use almond flour or walnuts. I tried sunflower seeds and sesame seeds and they just tasted crazy so I don’t recommend them. Kelly, What would be the almond flour measurement if using rather than the whole cashews? Thanks! I would start with the same measurement and add 1 tablespoon at a time until it looks like a thick pancake batter. Grain free bread intrigues me and frightens me all at once. I use almond flour regularly in baking but never in bread and I’ve never used cashew flour. This is so interesting. I would have never dreamed up this recipe, and they look great. wow I didn’t know we can make bread usiing coconut flour! and it looks great! Interesting, so the coconut flour and the tapioca flour replaces the regular flour. I didn’t even know tapioca flour existed, clearly I need to get out more. Also sold as arrowroot in a lot of stores in Australia. Whatever gene people have that make them be able to bake bread, I don’t have. These look so good I wish I could make them. This may seem like a dumb question but do you cut each bun in half? Just wondering if this makes three complete buns or six complete buns. I do plan to order this pan. This recipe looks amazing, like all your recipes. Also, where do you get white sweet potatoes? Your ebook has several recipes I can’t try because no one has ever heard of them. Hi Patricia, I didn’t cut them in half. You could, I guess, but they would be rather thin. Regarding the sweet potatoes, my grocery store carries them. You could substitute normal sweet potatoes but they will give the recipe a little more color. Now that’s a bun I could tolerate! I’m working very hard to give up grains (not totally but mostly) and I’m finding that when I do, I feel so much better. I need to experiment more with alternative flours, which I’m a little afraid of at the moment. Wow they look great! I’ll have to try these one day. Oh how I miss buns. Every recipe I have tried, the bun has without fail, crumbled. How does this recipe hold up??? It’s a really sturdy recipe. I’ve grilled these also with butter and they turn out excellent! 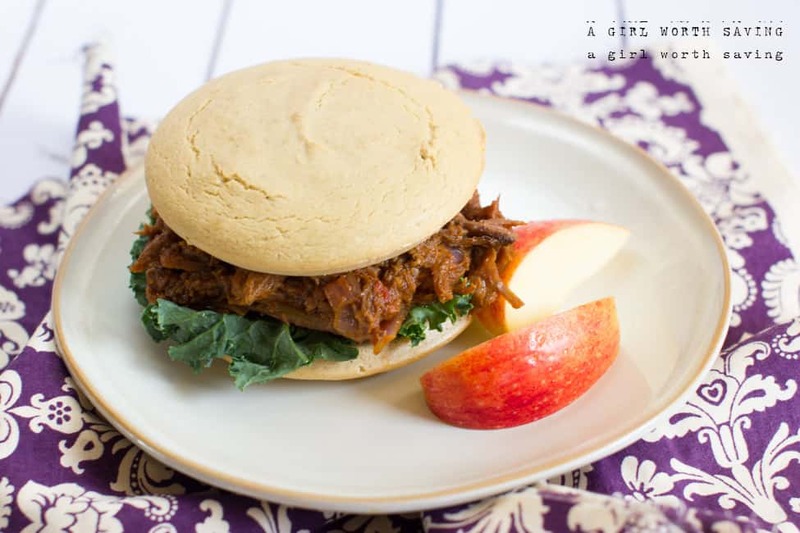 What does ACV do in gluten-free baking? I have seen several pale/grain-free recipes that call for it. Can you substitute something for the tapioca flour? Maybe more coconut flour or flax seed meal? I am trying to stay away from all starches, including tapioca, arrowroot, etc. 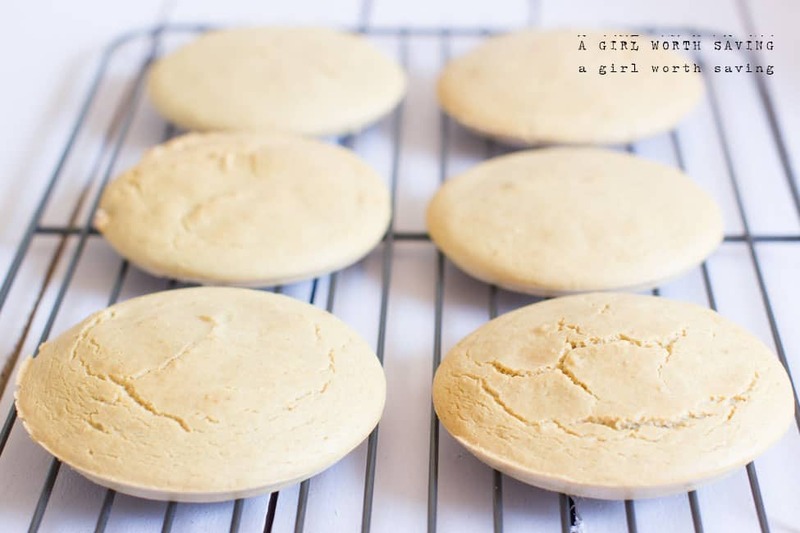 Dawn, I’ve never made these without the tapioca flour. You could try more of a nut flour so the consistency is the same but I have no idea if it would turn out right. Dawn, I didn’t have tapioca flour in the house the first time I made these. I ground cashews and walnuts into the amount of nut flour I needed, flax meal for the coconut flour, and something called kale sprinkles for the tapioca, is a nutritional yeast, kale, and spices combination. Well, the result was very rustic, but it held together and smelled so good. I ate two buns with a hamburger. The next day I had a roasted veggie sandwich from leftover grill from the night before. It was super. I now have the correct recipe items and am going to try Kelley’s recipe as is tonight. Would you be able to make a batch and freeze them? Or would they just not be the same? Madison, I have not done this so I can’t share. The next time I make this, I will make extra and try it out. I froze them and they turned out really well. I just reheated them in the microwave and they were as good as new! Thanks for sharing that Peggy! Hun, you will probably need to add anywhere from 1/4 cup to 1/2″ cup. The batter is similar to a thick pancake batter. I picked up some cashew flour the other day, and I used 1/3 cup in place of the cashews. I had made the recipe using whole cashews several times, and 1/3 cup seemed to get the batter about right. I’m loving how quick the cashew flour is. Instead of dirtying my food processor (which can be a pain to clean), I just throw all the ingredients in a bowl, whisk, and bake it off. Takes like five minutes, and there’s less to clean. Hurray! Where does one get a “hamburger bun maker” and do you have any suggestions for making them without one? I use this hamburger pan -> http://amzn.to/19oKM8P. If you don’t want to buy something like this you can alway make this in a baking sheet and cut the buns into squares. Made these tonight and am really pleased with the end result! Enjoyed them with chopped barbecue beef! I actually sliced each bun so that I ended up with 4 sets of buns. Will definitely be making these again! For those of you afraid to eat grain free and substitute breads….this is the most sustainable AND doable lifestyle foodwise I have ever attenpted. My whole family does it and we all feel a lot better. My husband and I have both lost 10 pounds in a month too. I make TONS of grain free breads with coconut flour, almond flour, tapioca flour, arrowroot powder, and many other amazing things. We still eat pancakes and everything 🙂 Just be open minded and creative. My two cents! LOVE THESE! Thanks for sharing that tip Jessica! I made these last night in tiny hamburger molds. I am wondering how big in diameter your suggested pan is? Mine is big enough to make slider sized buns so I made these last night with a variation of your Thai chicken burgers. What a fun meal! Hi Angela, it’s a muffin top pan and it’s pretty wide. I’d guess 3″ wide? This is the first Paleo bread I found stomach-able. It is very good, and was easy to make. I used 3 mini spring form pans and then cut the buns in half. Worked great. Also glazed the top with Egg whites to give it that shiny bun top. I’m freezing some now to see how they defrost. I’m so glad you enjoyed them Charles! I have been wondering how to make these for a while without the proper muffin top pan and I came across some small foil pans at the dollar store the other day (the kind that pot pies often come in) and they turned out perfectly. I made these yesterday, and they are very good. I used to buy the sandwich thins, but since going paleo a month ago, I’ve really missed them. But now I can make my own and eat them with whatever I want with no guilt. Thank you so much. I really wanted this recipe to work, it was a little dry and tasteless. I am going to try this tomorrow only with some Italian seasoning, some coconut milk and hopefully it w I’ll be better. Are the cashews supposed to be soaked before using? Nope, I only use unsoaked cashews. Just made this for the second time. Doubled it as I have a 12 count muffin top pan. I love how sturdy these are, especially when I want to load them with chicken salad or tuna salad. I just use them like a ‘platter’ for my food. Yummy! Yum, these are my favorite buns and so versatile! These turned out scrumptious. I made them for burgers but I had to try them now so I grabbed some meat slices and mustard and mayo and it was wonderful! I used a whoopee pie pan so instead of 6 large buns I got 12 small buns and they only had to cook 10-15 minutes instead of 25. I also didn’t have any tapioca starch on hand so I subbed arrowroot starch instead. I accidentally left out the salt and they still turned out great. I also used sparkling water instead of regular. Instead of cashews I used store bought almond meal. This recipe is a keeper! Can’t wait to make the big ones when I buy the right size pan. Thanks Kelly! Wanting to do this recipe, and wonder if the cashews will just turn into cashew butter in my Vitamix wet container? I don’t have the dry-grains container… But will it matter, if it is cashew butter or flour, since the recipe turns into a “thick pancake batter” consistency? Aw, you are so welcome Chipper and I’m glad you all enjoyed it hun. Hi, Thanks for the recipe. Can I use almond flour instead of making cashew flour? Would it still turn out? Yes, you can use almond flour with no issues. Thank you for this recipe it is a real winner 🙂 I tried it for the first time last night and I think that it will very soon become a stable recipe in our household. So glad you enjoyed it hun. Love love love this recipe! I modified the flours a bit when I made it. I used 1/4 c each of coconut flour, tigernut flour, tapioca flour and sweet potato flour from Anti Grain foods. They came out perfect. Such a versatile bun! It’s one of my favorite recipes too Maeghan! Love how you changed it. These look so easy Kelly. I’m wondering about carb content from tapioca flour. Any suggestions to replace the tapioca flour with something lower carb? Thanks for the recipe. I have yet to find a low card replacement for tapioca 🙁 I will share when I find something! I am allergic to vinegar, what can I use instead? I have not had a hamburger with a bun for over 10 years, having a gluten allergy. Everything I have tried to make falls apart. These sound perfect! I have ordered the non-stick bakeware listed and am ready to try these, but need a substitute for the vinegar. Can you do lemon juice? I would try that hun. Hello, Kelly! I have been happily making these buns for my family but now have found out I have an egg allergy. Has anyone tried replacing eggs with gelatin eggs? Thank you so much! Very grateful for your work. I just made these. I used 1/3 cashew flour and they are excellent! So easy and tasty! A winner! Thanks! What can be used in place of bun pan ? You can use a plat baking sheet and parchment paper and just make the shapes of the bun on them hun. 1. What if I used only coconut flour? 3. Is there another healthier choice of pans? Coconut flour only will not work and you would have better results finding a recipe that only uses coconut flour. You can use a stainless steel plan and make hamburger bun shaped with the batter. These hamburger buns are FANTASTIC. Thank you for this recipe. 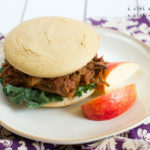 I purchased the pan and followed the recipe as written and I had the best burger/bun in 3 years, since becoming gluten sensitive. I am making them on a regular basis. This bun has a pleasant taste and doesn’t crumple like other gluten free buns that I’ve purchased. I am going to try freezing them for a fast sandwich. Once again THANK YOU, THANK YOU, THANK YOU. You are very welcome hun!